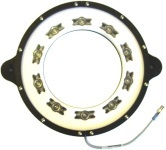 Part of the Monster series manufactured by Spectrum Illumination, this ring light is typically mounted around a camera lens for bright-field illumination. However, it can also be mounted off-axis as a large spot light. This light is best for projects requiring a lot of light. When your parts are moving fast, you need to light a large area, or you have a long working distance, this is the light to consider. It can be mounted 12" to 20' from the object to be imaged. LED optics and diffuser options are available that make it possible to obtain closer working distances and/or larger coverage areas. Please contact us if you’re interested in controller options, a different diffuser material, different LED optics, a longer cable, or a high-flex cable. Window: Shower Glass Diffuser Window options include thin film diffuser, white diffuser, or clear cover. Optics: 12 degree lenses Optional 30 degree, 50 degree, wide angle or line generating lenses. Cable Length: 4.0 m (13.1 ft) Optional 8, 15 and 30 meter standard cables; 4, 8 and 15 meter high-flex cables.